Above left: Detail of plaque no. 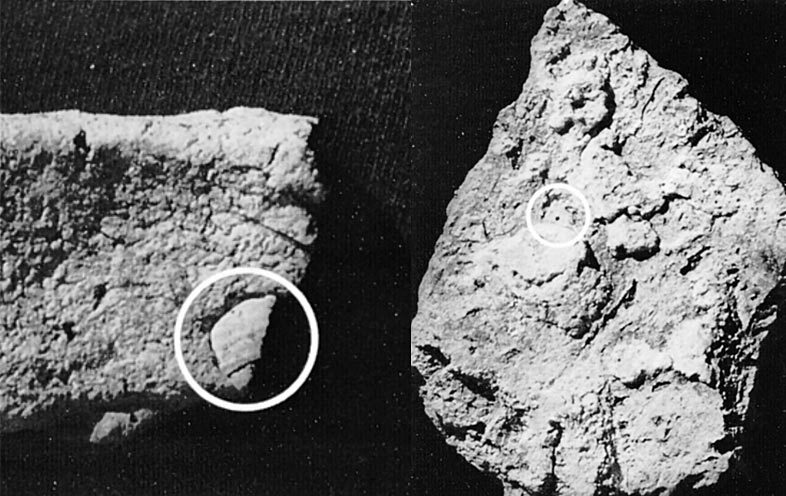 8, showing in the white circlet a macro-particle of white steatite with parallel saw marks. Above right: Close-up view of the object reproduced in Pl. IV c; the white circlet encloses a squared sheet of white steatite, representing an unfinished disk-bead recycled as refractory material within the ceramics temper. Mackay suggested that these plaques and cylinders could represent prepared lumps of the raw material used for making faience (a hard material which was used for making jewellry, animal figurines and tablets with the indus script). Some of the cylinders also had evidence of glaze on their sides. In 1985, Massimo Vidale examined 9 new fragments of such paste plaques that were recovered from Chanhudaro from surface explorations in the previous year. They were all of a similar ceramic material, with a whitish-buff colour and whose surface was "pumice-like". This paper presents his analysis of these fragments based on compositional and relational technological features. So, rather than raw material in faience production, Vidale suggests these are structural compnents of furnaces that were used in "highly specialized ceramic manufactures" such as glaze-making or faience glazing. The glaze drops mentioned by Mackay, and also on one of Vidale's specimens, could have been drops falling from above during the firing. Vidale, Massimo. "The paste plaques and cylinders of Chanhudaro: A descriptive report." Annali dell'Istituto Universitario Orientale 47.1 (1987): 57-66.